The restaurant industry is increasingly integrating automated processes into their services. While some people miss nice old-fashioned communication with a waiter, others enjoy technological establishments. Automated restaurants are still a novelty in most parts of the world, but their future is promising. In case, you’d like to test this brand new dining experience, we have prepared a list of the top functional technological restaurants. This San Francisco restaurant astonished all their visitors back in 2015 when they realized they were the only human beings in the dining hall. No cashiers or waiters ever showed up, as Eatsa practices a fully automated self-service process. Long rows of touch-screen tablets are installed along the walls. Clients can use them to place orders and pay with their bank cards. After that, visitors proceed to the serving area. Orders appear in transparent little “cubbies” similar to storage cells. Customers’ names appear flashing on the cubby screen. Clients then can take their food out and bring it to their table. All the food served is freshly made by the team of cooks who are hidden behind the serving walls. Eatsa does not use half-finished products and the restaurant is vegetarian. The company’s vision is to promote a healthy lifestyle by making fresh vegetables and fruit more available to the population. Their prices could become more affordable due to the use of fewer humans in the workforce. Technologies make human work more efficient, allowing the management to concentrate on the quality of food. They can spend time developing nutritious tasty recipes instead of improving the serving process itself. Moreover, the serving system is reminiscent of fast food chains, so even busy people can enjoy a quick healthy snack. Such an attitude makes a positive difference in the catering industry. It is especially important for the citizens of the USA where obesity rates are still alarming. Therefore, the Eatsa chain is quickly growing, expanding the number of locations to 5 within three years. This newly-opened Boston restaurant strives to serve healthy food as well. Though not fully vegetarian, the menu is abundant in nutritious and affordable ingredients. Unlike many typical quick-service restaurants, Spyce offers many grain dishes, brown rice, fresh chicken meat, eggs, and vegetables. However, that is not the restaurant’s main attraction. The uniqueness of Spyce is the robotic kitchen developed by a bunch of MIT students. Most preparation is done automatically taking no more than 3 minutes. The robotic kitchen receives information about customers’ orders wirelessly from the database of the self-service menu kiosks. It takes the necessary amount of the frozen ingredients from the refrigerators, puts them into hot spinning woks, cooks and stirs them for a set time, and finally pours the hot meal into the ready bowl. Human workers take their turn to add fresh ingredients, seasoning or dressing, decorate the meal and serve it to the clients. The idea behind the robotic kitchen creation was very simple. Delicious and nourishing food should be accessible. Many people resort to junk food because their low income does not allow them to buy expensive healthy meals and products. Spyce is able to deliver quality food portions for only $7.50. Though the orders are made via touchscreen panels, cash is also acceptable. Spyce is a customer-friendly establishment, preserving a nice touch of hospitality characteristic of small local diners. There are not many sitting places; much food is prepared for take-out. The human staff take care of guiding the customer through the ordering process if needed. They also welcome the visitors at the door, consult about the available dishes and serve them with a smile. The business owners also show their environmental responsibility by using compostable tableware. Such small details and dedication to quality food and service bring Spyce many grateful clients and favorable reviews. The Chinese business giant, Alibaba Group, opened their technological restaurant in Shanghai where robots serve the food instead of waiters. Human personnel is responsible for greeting new customers, helping them with their orders, and preparing food. This fresh seafood restaurant is located in Alibaba’s Hema Supermarket. A special Hema app is designed to check in a chosen table, order food and pay for it. The robotic arms and mobile counters are navigated with the software that processes customers’ QR codes submitted at every dining stage. Individual QR-codes are assigned to every dining table so that the orders should not get confused. Clients personally choose the seafood they’d like to eat at the counters. Human assistants pack it in the bag and place on the conveyor belt to be delivered to the kitchen. While the guests are shown to their seats and wait for the main dish, they can also choose side dishes directly from their app. Ready-made food is put into lunch boxes and placed on trays. These trays move on the automated surfaces around the restaurant premises and arrive straight at the customer’s table. This Australian café is the first national fully-automated takeaway establishment. The quick-service snacks are almost 100% organic and produced from local fresh ingredients. There is no need to eat junk when you only have time for a quick bite anymore. Just like its American counterparts, Hey Zeus uses touchscreen panels to place the orders. Ready orders are delivered in brown paper bags by the conveyor belt. Automation allows this restaurant to fulfill numerous orders with only 8 human staff involved. It also makes the ordering process very quick. Many people prefer less human interaction at takeaway spots. Their dreams have already come true in Australia’s first unmanned restaurant. Another Chinese dining place in Jinan offers a robotic alternative to waiter-client communication. Android robots serve food here as well as greet the customers at the door instead of human hostesses. A dozen robot employees deliver food on automated bicycles moving along the in-built restaurant’s track. 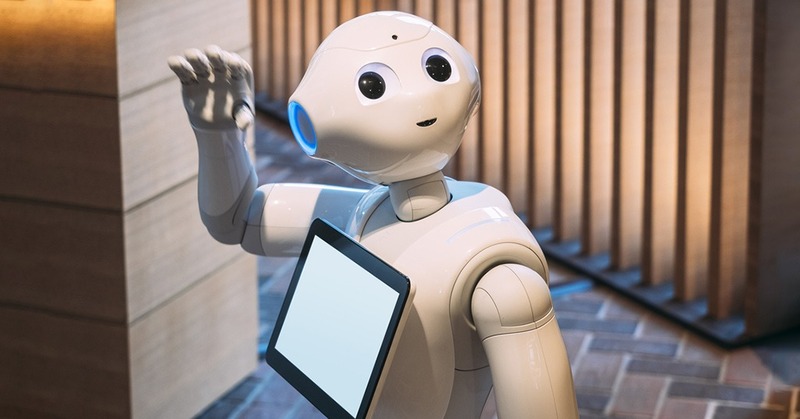 They communicate in electronic voices and resemble famous movie characters such as Star Wars droids or cartoon Wall-e. Robots do not only serve food but also smile and entertain their guests with dancing. The neon lights blinking in the dim restaurant hall help customers to completely immerse into the futuristic atmosphere while enjoying the hotpot meals. Many clients appreciate the staff’s eternal patience and amiability. Robots also have motion sensors to avoid bumping into customers and spilling food. Surely, the robo-dances give this place a unique charm as well.